Benito Mendez grew up in a large Hispanic family with five sisters, who, like sisters in any family, would play by dressing their brother like a girl from time to time. At an early age, Mendez learned that he hated the feel of hosiery. It is either perfectly appropriate or completely ironic that his very first buying job was in hosiery for Federated Department Stores (now Macy’s). Fortunately, that was only the beginning of his career in merchandise. It didn’t take him long to move on to other categories and even complete the company’s executive program in retail buying. In fact, he was buying sterling silver jewelry when a vendor told Mendez about a company called Starboard Cruise Services. 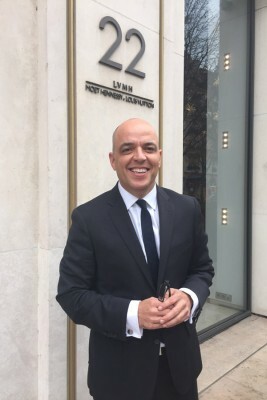 Mendez joined Starboard as a merchandise manager in 2001, a year after it was purchased by Moët Hennessy Louis Vuitton (LVMH). “It was so different from land-based retail channels, and it was part of a huge organization, so the opportunity was incredibly exciting,” Mendez says. He began by managing various categories of purchasing as a director of planning, but his responsibilities soon increased to include more categories and a group of buyers. Now, fifteen years later, he’s responsible for both planning and distribution as head merchant and vice president of merchandising, planning, and distribution. Mendez oversees a group of more than one hundred merchants divided into three units: watches/jewelry, traditional duty free, and accessories and apparel. He oversees business development, and vendor and brand management with a particular focus on growing top business with the right mix of assortment, pricing, and the greatest value added. Mendez has developed the ability to innovate on a global level while thinking about specific guest profiles—and it all comes back to delivering stellar customer service and a memorable guest experience. A particularly unique characteristic of cruise ship customers is that they are a captive audience. “We have the luxury of extra time with guests,” Mendez says. “So, it’s our responsibility to capitalize on that opportunity to connect with them.” But for Starboard’s merchandising team, that time with guests is only as valuable as understanding their needs and wants. Buying the right amount of goods and getting them to the right places around the world requires logistical skill, as does catering to the desires of different guest profiles across Starboard’s ten different cruise-line partners. Ensuring that each cruise line has plenty of its most popular global brands is essential, as is introducing new products that will be successful in those different markets. Yet as a global organization, Starboard maintains a close-knit, family-owned feel, and it’s that mix of the familiar and the global that makes Mendez feel so at home. His freedom to be entrepreneurial and think creatively aligns with his passion for business development. The ownership he feels for the business inspires him to deliver on the company’s promises of excellence. But above all, Mendez is motivated in his work by making a difference. “I can lead teams, develop people, and create new ideas,” he says. Having developed Starboard into a global leader of luxury is a notable achievement, as is building excellent relationships with cruise line partners, and delivering the same high-quality experience that a guest would have on Fifth Avenue. But as proud of his team as he is, Mendez is never done innovating. “The only constant in retail is change,” Mendez says. “If we’re not doing it, someone else will—so, we had better be doing it.” That means perpetually working on advances in technology, introducing new products and ways of shopping, and exploring untapped intersections to better connect with guests. It means increasing revenue and market shares, and expanding both the supply chain and Starboard’s global reach. But ultimately, it means continuing to innovate the customer experience. Mendez’s merchandise team at Starboard Cruise Services is committed to delivering excellence and creating indulgent memories for every guest, on every ship, in every ocean around the world.